Home Promote Your Blog Posts How To Promote Your Blog Posts? 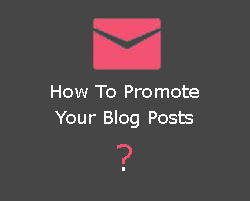 How To Promote Your Blog Posts? Today I am telling you some tips to promote your blog, so post. Many easy ways to people read your post/article, because people have not read your post when done a new post on your blog. You spend much time to researching, and writing your post, but your work is not fully done, because most of each blog post you need to promote and get much traffic on your post or blog. So below are some ways you can promote single your blog post. Be relax and lets planning where you share your blog post, and assess your every post. 1: Don, t copy to be someone's blog article. Write your own voice post. 2: Must attach one picture with each post related and make them original, don't, to copy other people, so images. 3: To get many readers to your post, update your blog post every day. Because readers like to read new post everyday. And craze to search new and unique content. Shear you every post on social media, you gain many readers to link your post on social sites. Create your personal and your business page, Group, and you also create your ad campaigning on Facebook. Tweet your post on twitter, and this is the biggest source of traffic. Pin your new post at interest, and create a board specifically for your blog post. You also shear on your Linkedin profile in your friends group, you also create ads on it. Publish your post on Google Plus, circle to get better SEO your blog. And get more visitor to your post. Simply create your account "stumble" and start sharing your post. Send your post to "Digg" to share with others and help them discover. This is the most popular bookmarking site. You easily share your post on it. You help others discover your post when you publish to Delicious. This is good search engine for blog, so must be use this to the good user response. 1: add your contacts' blog, post in your e-mail newsletters. And shear your latest post via e-mail. 2: shear your post with every person you know. And also shear post with groups etc. 3: you also add your signature to your latest post. 4: send email to your email, s contact list for asking feedback good user experience. 5: RSS feed automatically sends your post to readers who already subscribe your blog RSS. 1: add your comments on other, so relevant blogs/website to attach your blog/site link to your related post. 2: send a guest post to others relevant blogs, with writing something good. 3: tell others bloggers to link your relevant blog posts, and these tips are very helpful to increase your back-links or boost your blog traffic. 4: connecting your blog links to other blogs to support us banner etc..
5: join bloggers and blogging community to shear links each-others. You must apply above things to your post. The best information is that you think yourself, how to get much traffic. And you know traffic is not a person this is a money :) always use your commonsense to boost your post traffic to every post. Share your good ideas to me, and leave your comments or suggestion comment below!